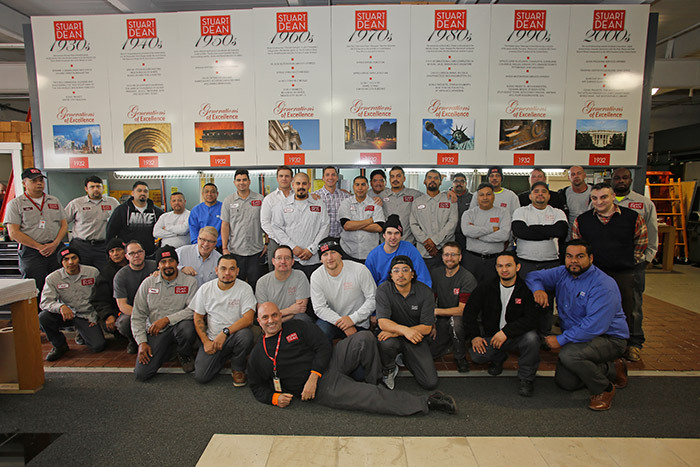 Stuart Dean is the national leader in the restoration and maintenance of metal, stone, wood, glass, and facades but we’re most proud of our ability to create and maintain a safe work environment for our technicians, our clients and building occupants. We continually develop and implement state-of-the-art methods to achieve safety and service excellence in each and every project. 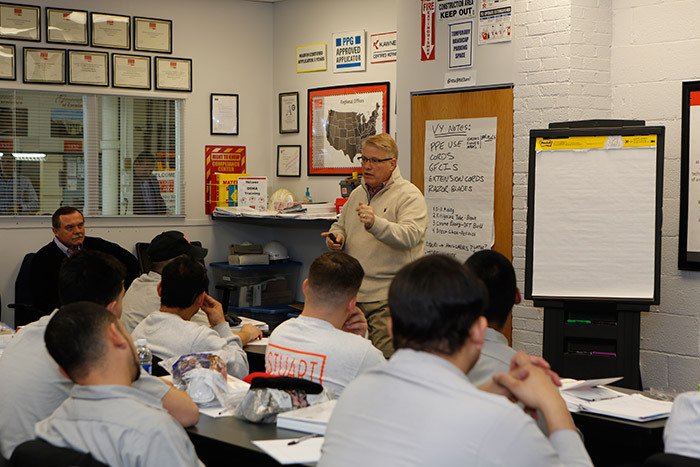 That’s why Stuart Dean established a National Training Center to teach employees vital safety and hazmat regulations. We are dedicated to not only meeting, but exceeding, the safety and environmental standards outlined by the United States Occupational Safety and Health Administration (OSHA), and the metal, stone, wood and glass industries. 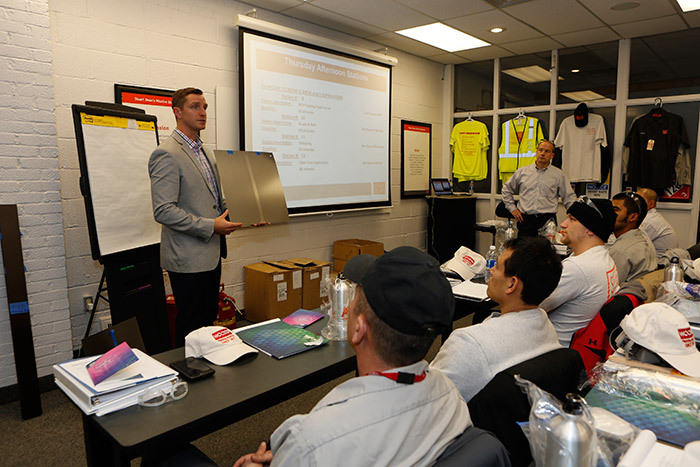 Stuart Dean University teaches team members the proper use of equipment, policies and procedures through hands-on demonstrations and vendor/partner engagements, to successfully meet our clients’ expectations. All of Stuart Dean works hard to maintain a measurably superior safety record. Understanding safety and hazmat Regulations- OSHA Training Courses. Proper use, handling and disposal of chemicals and cleaning products. Access equipment and scaffolding assembly. Customer communications and customer service engagement. Pre-work masking and protection of adjacent architectural surfaces and finishes. Work skills, from entry-level to advanced, in all of our service disciplines. How to read & understand SDS sheets, Chemical Technical Bulletins, and blueprints. Understanding electrical work hazards and fire hazards in the workplace, along with the proper safe set-up for equipment and tools, on all of our worksites. SVP of Operations Allen Podratsky reviews operations procedures. Classroom instruction occurs daily. National Facade Manager Chris Incorvaia reviews the fine points of high-performance field-applied coatings. 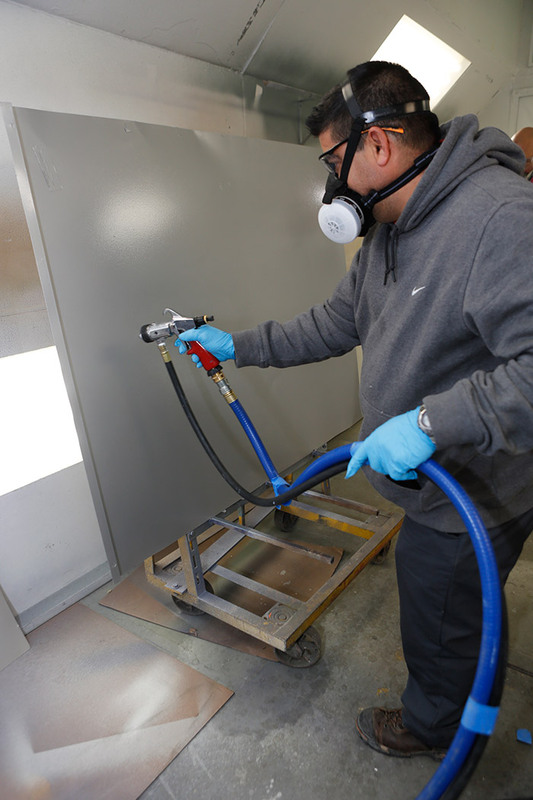 Partners from Dumond Chemicals train in use of water-based, zero VOCs and 100% biodegradable paint strippers. The 2017 Class of Stuart Dean University! 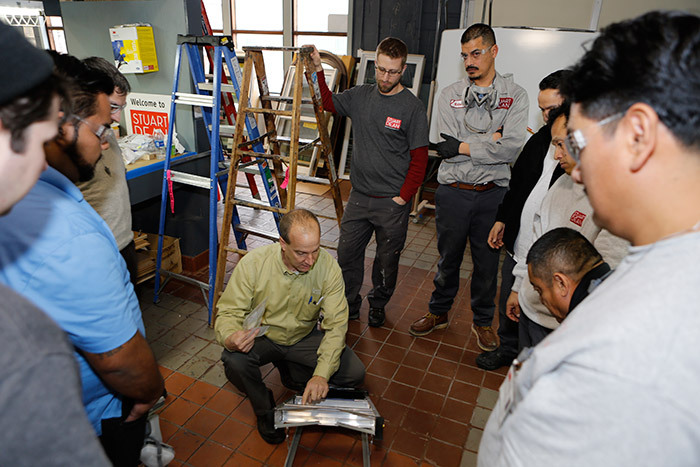 The ‘Dean’ of Stuart Dean University, Victor Younger, instructs on the fine points of ladder safety, lock-out tag-out procedures and a wide range of other safety procedures during the course of training.